I’ve been told I’m a fatalist. Perhaps I am. For all the research I’ve done on the Future of Work and among the amazing peers I’ve collaborated with in this category, it is so clear to me that the past definitely does NOT dictate the future. As the image implies, there was a time when we all expected to follow a common path: from school to a job for life. I’ve seen firsthand how technology has wielded its way into the marketing sector. It’s changed the way people have consumed information and how they communicate to each other. 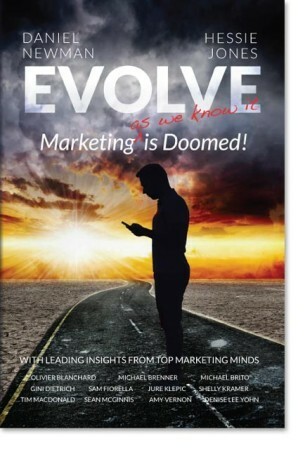 This disruption in communication has turned the marketing industry on its head and we find ourselves continuously struggling to keep up. Within a decade, I have seen colleague’s careers cut short – those who have banked tremendous experience in traditional mass communications: TV, Print, radio and promotions. The pace of technological disruption has become so commonplace within the communications industry that marketers are turning to MOOCs, reference blogs just to keep pace. We are not alone. All industries are experiencing this. The World Economic Forum recently published a report which “represented more than 13 million employees across 9 broad industry sectors in 15 major developed and emerging economies and regional economic areas.” The report indicates.. Developments in previously disjointed fields such as artificial intelligence and machine learning, robotics, nanotechnology, 3D printing and genetics and biotechnology are all building on and amplifying one another. Smart systems—homes, factories, farms, grids or entire cities—will help tackle problems ranging from supply chain management to climate change. 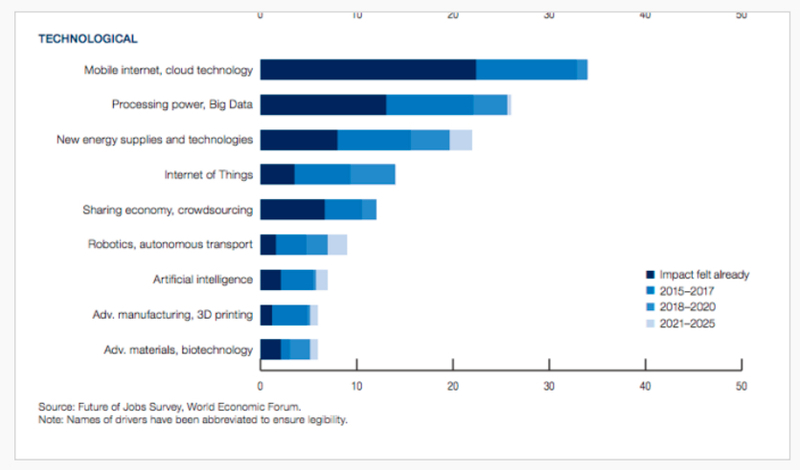 The chart below cites the instigating variables that are forcing industries and organizations to undergo major structural and operational changes: from prevailing mobile consumption to the increasing efficiency of cloud computing to big data usage…. We are also witnessing a decline in pure labor. This article uses the term “transitioning labor”, which is disconcerting, in and of itself. 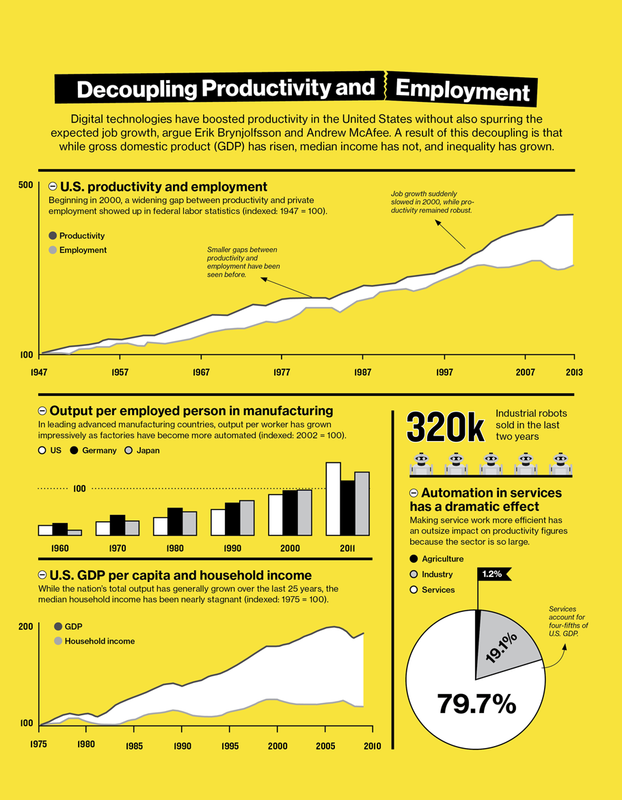 The larger losses (between 2015-2020) will be felt in office and administration and manufacturing and production to the tune of 7.1 million jobs in the U.S.
What technology has enabled is an exponential surge in productivity that has greatly improved gross domestic production and efficiency in the meantime. …as businesses generated more value from their workers, the country as a whole became richer, which fueled more economic activity and created even more jobs. Consider this, however. Based on the chart below, productivity and employment, which for decades, correlated, began to diverge around the year 2000. As production strengthens, employment begins to wane. Overtime the economic growth in certain sectors do not rely on creation of jobs. Note the growing disparity between GDP and household income since 1975. The median household income overtime remains “stagnant“. Authors of Race Against The Machine: How the Digital Revolution is Accelerating Innovation, Driving Productivity, and Irreversibly Transforming Employment and the Economy, Eric Brynjolfsson, professor of MIT Sloan School of Management and Andrew McAfee call this the “Great DeCoupling”. People are falling behind because technology is advancing so fast and our skills and organizations aren’t keeping up. The socioeconomic implications of this transition period is being felt today. 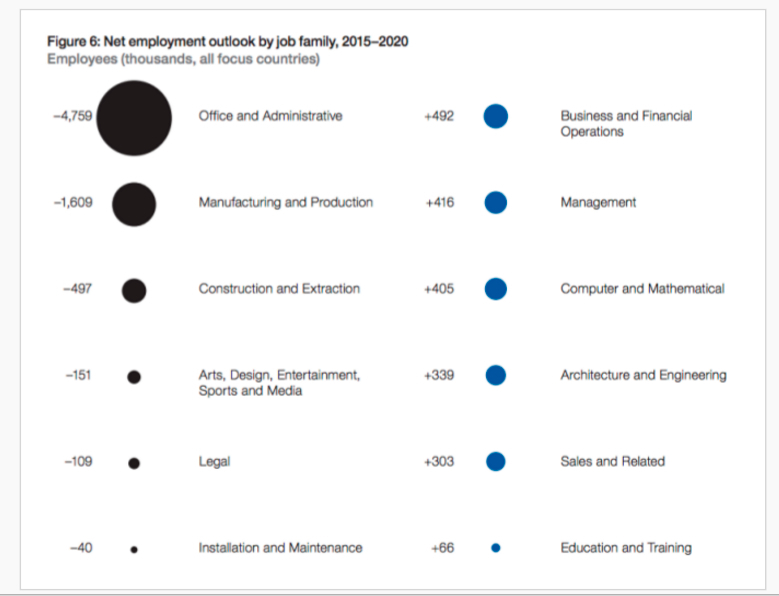 Despite the larger economic impacts of job losses, those who are thriving fall within technology sectors and industries relying on the next gen skillsets to respond to this increasingly competitive environment. Consider how Uber is currently impacting regulations in the taxi industry… or how AirBNB is leaving the smaller hotel chains scrambling… or how Tesla and Google will bring the car industry to its knees. This is progress. But it’s also widening the skills gap and polarizing an economy. As student debt balloons, it’s time for society to re-evaluate postsecondary education—and our entire system. We need to create new and innovative systems that help individuals achieve their potential. It’s clear, the Harvards and MITs of the world will need to change their models in the future as well. Free or more affordable education in the form of MOOCs (Massive Open Online Courses) or organizations like The Khan Academy, or The Code Academy are already drawing students (of all ages) in droves. The success of the Industrial Revolution or later was a result, in part, to the current education that was in step with the demands of the market. Not anymore. The disconnect between the current education and the needs of organizations has never been clearer. PWC came out with this announcement last August and stated that degrees or A-level results will no longer be a criteria in assessing the value of potential candidates. What I am observing today, among peers and Millennials: We are all in a mode of REINVENTION and continuous learning, striving to learn new skills in web development, writing, coding… all in the effort to be marketable under the new job conditions. As part of our series on Humanity in Data series, we will continue to explore the need for human-only abilities to help industry and society to progress in the coming decades. While automation and robotics will displace simple functions, and be able to analyze zetabytes of information and deliver conclusions, human decision-making and creativity will be necessary to adjust to the growing challenges the world will surface. What’s exciting is that the resources available for learning are vast. As dismal as the current state of the nation is, we are at a critical point of reinvention that allows each and everyone of us to create opportunities to respond to real needs today. 1. Tele-surgeon: These surgeons operate on people remotely with robotic tools instead of human hands. 2. Nostalgist: Nostalgists are interior designers specializing in recreating memories for retired people. The elderly of 2030 who don’t want to reside in a typical “retirement village” will have the luxury of living in a space inspired by their favorite decade or place. 3. Re-wilder: These professionals were formally called “farmers.” The role of the rewilder, however, is not to raise food crops, but rather to undo environmental damage to the countryside caused by people, factories, cars, etc. 4. Simplicity expert: The simplicity experts of 2030 are interested in looking at how businesses can simplify and streamline their operations. For instance, they can reduce 15 administrative steps to three, or four interviews to one, or three days of work to a half hour. 5. Garbage designer: Garbage designers find creative ways to turn the by-products of the manufacturing process into high-quality materials for making another entirely separate product. 6. Robot counselor: In 2030, robots will play a greater part in providing home care and services than they do today. The robot counselor will be a resource for picking the right bot for a family, by observing how the family interacts and identifying their needs and lifestyle. 7. Healthcare navigator: These professionals teach patients and their loved ones about the ins and outs of a complicated medical system. The navigator also helps people to manage their contact with the medical system with the least amount of stress and delay. 8. Solar technology specialist: These specialists may own land where they manage a large spread of solar grids, to sell the harvested power to stations and other communities — or they may work as consultants in cities and other urban spaces, helping building owners to design, build, and maintain solar panels. 9. Aquaponic fish farmer: In 2030, populations of wild fish are disappearing — so new production methods like aquaponics will step in to replace fish that we can no longer catch in the wild. Aquaponics combines fish farming with gardening, where plants grow over water to cover its surface, while fish live below. The plants return oxygen to the water, and the fish produce waste that provides fertilizer for the plants. Retirement doesn’t exist for many. Reinvention is mandatory to survival. Organizations and the employable workforce are figuring this out as the needs of the market evolve. For the next generation, perhaps the question needs to change from “What do you want to be when you grow up?” to “What do you think needs fixing and what do you want to do to make a difference?